Don’t just install a High Voltage Pack. Learn what goes wrong and see if you can fix it. 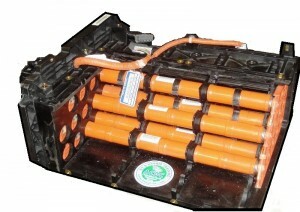 A high voltage battery pack is the most expensive part of any hybrid or plug-in car. This 3 day class is held at the ACDC training Center where we have all types of battery packs, equipment, HEV, PHEV and EV to use. 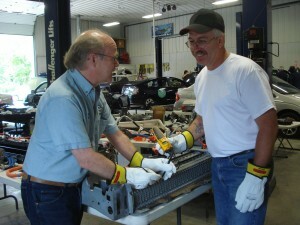 Come learn real world repair procedures for the cars you see in your bays. Do you know what to do when the codes are telling you a high voltage battery is having problems. Will a bus bar replacement work? Can I install one module? Where and what do I need to own to do the work in house? 8. 74.4% of your time will be spent working in the shop. 13 PHEV -EV and HEV cars and SUVs . Any questions before you sign up Craig will call you and answer them. Fee: $3,000 includes 3 nights hotel, all meals, note book, jump drive with class info, ground transportati0n ( a hybrid of course) and 3 days of training. You only pay your airfare. Meet David Taylor. A shop owner in Sanford, North Carolina and a graduate of Up Your Voltage #1 (June of 2006), out premier class. David and ACDC spent years working together in 2006 to 2012. What David did for years was learning the hard way that bad cells must be replaced not “reconditioned”. When David Taylor started his company, Re-inVolt, in 2008 or so ACDC was there helping him find customers to buy the RMD packs. It was mostly 2001-2003 Prius pack that were a failing. Re-InVolt did well. David sold his hybrid battery company to Dorman Products in October of 2013, I was involved with conducting battery classes for Dorman after that. I had called Midtronics (Full discloser, they are an ACDC customer) and they were kind enough to send ACDC the latest GRX 5100 tool used by GM. I had had a Midtronics capacity meter for years. ACDC then hired a great tech that did “Up Your Voltage” in 2013 (his boss died and the shop closed suddenly) to research claims made about “better mpg, fixing packs without replacing bad cells, etc”. He spent weeks working with our fleet (some 12 HEV, PHEV, EV then), numerous old battery packs, the most modern equipment and came up with this. “If the pack is producing codes, replace it”. The long term customer relationships you have do not warrant experimenting with their cars. Before Re-inVolt figured out the process of pack rebuilding, there really wasn’t much out there except used or new battery packs. Dave used Gen II cells and with his own equipment he was able to determine the good modules (a group of 6 cells) that were usable. Next was a process for matching those modules to each other (28 in all). Installing Gen II modules in Gen I packs became the “thing” and everyone got into it. Many small battery companies failed as they didn’t know what Dave knew; when to hold’em and when to fold’em. You can rebuild batteries successfully. Dorman and other Companies rebuilds Toyota packs by the thousands, with a 1 year warranty in most cases. ACDC does not recommend any Toyota / Lexus rebuilt packs except OEM. A few years back we did but too many of our ACDC hybrid qualified shops were having trouble with the packs. ACDC recommends Genuine Toyota packs as the modules are new. There are NO new modules for sale as Toyota owns the factory and the patent. Honda NiMH cells have clones and RMD Honda packs may be OK as the cells are new. What does an ACDC Shop (QSP) usually do with hybrid battery issues? First of all, these are independent shops that access their own market. Most (99%) of QSP owners will offer the customer a rebuilt pack from an aftermarket brand when the car is in need of replacement battery. This is when codes and warning lights appear that after a careful diagnosis the technician determines the failure is a worn out or out-of-balance pack. ACDC does not endorse any battery work until close to end-of-life, except filters, fan cleaning and bus bar replacement. This will vary with year, make, model, driving conditions, weather extremes and other factors. Some customers will want a new factory battery if the warranty has expired. 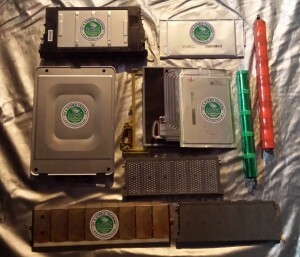 A few ACDC QSP owners like to rebuild their own packs. In that case, ACDC has equipment that we sell to let them do exactly that. With few exceptions, the QSP owners after a year or so trying to make a business case for the tech to rebuild a pack, stops that process and sells a RMD pack so the manufacturer is responsible for the replacement if something goes wrong. Again we recommend OEM RMD packs except for Honda. The cost for the equipment to rebuild a Prius pack for example can be as little as $3,000 and much more. As our students and QSP owners learn from ACDC and we learn from them too, the next generation of batteries and things are getting better. All OEMs all using Lithium since M/Y 2013 except Toyota. Toyota owns the largest Ni-MH battery company in the world. The 2016 Prius has an optional Li-ion battery. What will that do to the reconditioning business? Most likely it will slow down but not for a decade or more as the software and hardware in all Li-ion equipped cars, re-balance each cell during charging and the chemistry is less problematic. Just like automatic transmissions (and many other expensive large parts) the aftermarket rebuilders do a good job of helping independent shops keep the shop productive with quality remanufactured parts and today that is available by many well-known companies. ACDC has a business relationship with many companies involved with hybrid and plug-in cars.